In the nineteenth century, several factors combined, which both facilitated and necessitated the expansion of the Port of Dublin. The seaward approaches to Dublin Port have always been hazardous to shipping. There are several offshore impediments to safe navigation that include the Kish Bank and Burford Bank, upon which hundreds of ships have been lost while attempting to reach the port. Having braved all of these dangers, shipmasters now had yet another danger to face as they approached the mouth of the River Liffey. During the preceding centuries, access to the port was impeded by a hazard to navigation in the form of a large sandbank, known as the Bar of Dublin, which lay across the entrance to the main navigable channel of the River Liffey where it flows into Dublin Bay. The depth of water over this obstruction was as little as a few feet at times of low water spring tides, and ships approaching the port were frequently obliged to stand off or anchor to await high tide. When onshore winds blew up, many were thus caught on a lee shore and wrecked on the broad sandy expanses on either side of Dublin Bay, known as the North and South Bull. These areas are literally paved with the remains of the wrecks of sailing ships that were dependant upon the winds and tides and were equally, at times, at their mercy. The first notable improvements to the port entrance were carried out in the latter half of the eighteenth century when the Great South Wall, which ran from Ringsend to the Poolbeg Lighthouse was built. This helped to define the channel and to render it more navigable, however, a great breakthrough came in the early nineteenth century. Various reports had been submitted to the Port Authorities as to how to overcome the problem of the Bar, one of which was prepared by Captain William Bligh of the famous Bounty Mutiny in 1801. 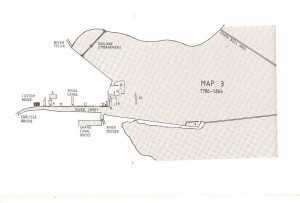 He had undertaken, on behalf of the Admiralty, a comprehensive hydrographic survey of Dublin Bay and its approaches and one of his recommendations was for the building of a further wall on the north side of the channel. Other engineers had made similar suggestions and as a result, the North Bull Wall, which runs from Clontarf to the Bull Lighthouse, was built between 1819 and 1824. The tidal water thus enclosed by these walls created a sluicing action on the ebb tide, which, over the next few decades, shifted the sands of the Bar of Dublin around northwards to form what is now known as The Bull Island, which remains today as a wonderful amenity for the citizens of Dublin with beautiful dunes and sandy beaches. This engineering work, combined with new dredging techniques, now gave free access at all stages of the tide to the port to bigger and more deeply laden ships. Up to this time, berthage in the port was confined to the north and south quay walls that ran from Ringsend right into the heart of the City. These had been adequate in the past to accommodate the size of vessels and the volume of trade that then existed, however, with the advent of steam powered merchant ships and advances in the technology of iron and steel shipbuilding, and a consequent huge upsurge in world trading patterns, the existing berthage and facilities for loading and discharging cargoes were soon found to be hopelessly inadequate. At first improvements were made to the existing quay walls by limited rebuilding and deepening but the pressing need for deep-water quays quickly resulted in various proposals being examined as to how this could be best achieved. Initially, traditional methods of coffer-damming and dry building were proposed by the resident port engineer George Halpin, whose duties also included being Inspector of Works and Superintendent of Lighthouses. With the onerous schedule of these duties, much of his work in the Port of Dublin was devolved upon his Assistant Engineer, an innovative genius who was to revolutionise the work of building the new quay walls in Dublin Port, Bindon Blood Stoney (1828–1909). Stoney was born at Oakley Park near Birr (formerly Parsonstown) in County Offaly in the Irish Midlands. He attended Trinity College in Dublin where he graduated with great distinction as a civil engineer. His first working appointment was as assistant to William Parsons, the third Earl of Rosse, in his observatory at Parsonstown where the Earl had designed and built a giant seventy-two inch telescope, known as the Leviathan, which is still in existence today. The Earl’s son, Charles Parsons, perfected the steam turbine which came to be adopted in many warships and other vessels. There can be little doubt that Stoney must have benefited from association with such inventive geniuses. He next took an appointment on a railway project near Aranjuez in central Spain and on his return to Ireland; he worked on the River Boyne railway crossing near Drogheda. 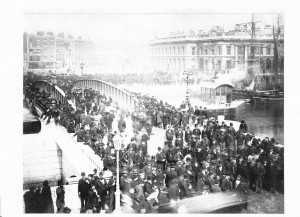 In 1856, at the age of twenty-eight, after several interviews, he was appointed as Assistant Engineer of the Port and Docks Board of Dublin. 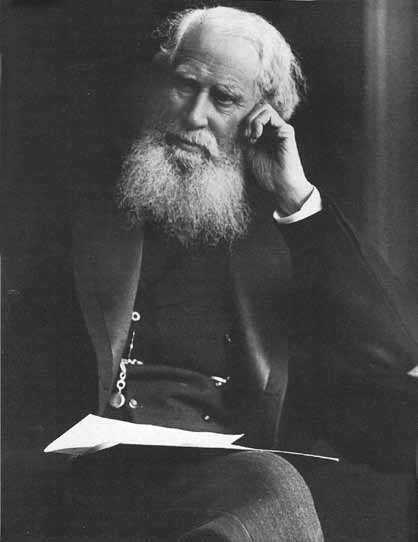 The senior engineer of the port George Halpin, had many other duties to perform in his capacity as Director of Works and Superintendent of Lighthouses for the many coastal lights that were then in the care of the Port Authorities and because of Halpin’s prolonged absences, Stoney became in effect the de facto port engineer. One of his first major tasks was to supervise the completion of a new graving dock. In 1862, Stoney submitted a counter proposal to Halpin’s to the board, using a method which he maintained would cost only half of that of the traditional cofferdam system with the necessity of laboriously hand laying cut stone blocks. He also contended that the work could be done much quicker with his method. 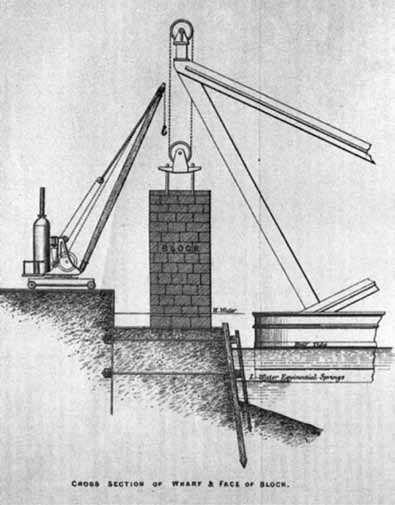 Stoney proposed to build huge prefabricated concrete blocks on the shore and to lay them on a prepared seabed by the use of a large floating shear-crane. He further proposed that workmen operating in a large diving bell, slung from a floating barge, be used to level the seabed. Halpin, understandably, was none too pleased at his subordinate’s attempts at a counter-proposal to his own and he attempted to scupper Stoney’s plan from the outset. He maintained that the idea was not feasible and urged them to accept his own suggestions. Perhaps the idea of saving so much money on the project, coupled with Stoney’s forceful arguments, must have swayed the members of the Board as, after much discussion, it was decided to adopt Stoney’s proposals. Halpin, whose health was at that time failing, decided to retire shortly after and Stoney was officially appointed as Senior Engineer. It took several years before Stoney’s plans for the deep-water docks came to fruition. There was urgent work needed in underpinning and re-building the existing quay walls and deepening the channel alongside. By 1871 the work on the new docks had been started and the first section to be built was what is known today as the North Wall Extension, which runs eastwards from the Point Bridge. The work was not put out to tender as it was decided to use direct labour within the port, a decision that was to pay dividends by the accumulation of useful skills among the workforce. The photograph of Bindon Blood Stoney shows an almost patriarchal looking figure and in some ways this was true. During his time as Port Engineer, Stoney gained working conditions and pension rights for the labourers and tradesmen in his care that were far in advance of those which generally prevailed at the time. 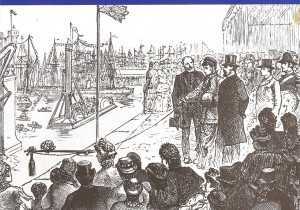 All of the equipment including the shear float and the bell was designed by Bindon Blood Stoney. He also designed the machinery to mix the concrete that went into the making of the blocks. The large-scale use of concrete using Portland cement was still in a basic stage of development in the middle nineteenth century. The concrete mixer designed by Stoney was capable of delivering about twelve cubic yards of concrete per hour and it was powered by a three horse-power motor. The blocks were cast on a specially built block wharf and allowed to cure for several weeks. Large cast iron girders were incorporated into the bottom of the blocks and the wrought iron lifting bars were attached to these. Large stones were used in the construction to bulk out the cast concrete. The procedure for lifting the blocks involved the shear-float moving bow-first up to the platform of the block-wharf, which was set low near the water. After the crane was attached, the ballast tanks in the after end of the shear float were filled and this tilted the barge enough to lift the block. The barge was then towed to the laying position. The shear float was described as… A powerful tubular girder…which distributed the shearing strains over the whole area… The area for the new quay was first dredged down to the solid substrate and the crew in the diving bell then levelled the seabed by distributing the gravel, or in some cases, loading any surplus onto platforms in the bell, which was then disposed of elsewhere when the bell was again moved. The normal crew consisted of six men and incredibly accurate results were achieved when the blocks were joined together. Grooves cast into the blocks were subsequently filled with concrete to key them together. Large rebates were also cast into the blocks to take stone facing blocks for the new piers and in some instances, part of the stone facing work was completed on the blocks while they were still on dry land. Each concrete block weighed three hundred and fifty tons. There are fine scale models of the shear float and the diving bell in the Engineering Department Museum in Trinity College Dublin. The physiological effects of working in compressed air may not have been fully understood by the crews working in the bell as there are several accounts of men suffering with ear trauma and bleeding from the nose and ears, particularly when working with colds or congestion, something that would be unthinkable in the present day. Nevertheless, throughout the history of the operations using the diving bell in the port, there is no recorded instance of any serious accident or fatality. The blocks were laid in parallel rows where berthage was required on either side of the new quay walls and space between was filled with spoil from the dredging operations. The walls above water were then built up in the conventional manner. Stoney retired in 1898 after forty-two and a half years of service, leaving behind him an efficient, modern, deep-water port. During his working life he received many honours and accolades from several sources including an Honorary Doctorate from Trinity College Dublin. He was the president of the Institution of Civil Engineers for many years. His opinions were sought and respected far and wide on civil engineering matters and port development. He died on May 5th 1909 and there were many tributes to him that mentioned his great achievements and his sincere humanitarian personality. There is a road in the Docklands area named after Stoney. Such was the scale of development achieved by Stoney and the port workers that no further expansion was required until well into the twentieth century. The shear float was laid up and it was scrapped in 1919. The bell with its attendant float was retained in the port and it was to experience a renewed career from the 1920s on. A new method of building quay walls was instigated by the Dublin Port Engineer who was appointed in 1917, Joseph H. Mallagh. This consisted of building large hollow concrete blocks on the shore and floating them into position where they were sunk and filled with dredging spoil. These blocks became known as ‘caissons’ in the port. Again, the diving bell was used to level the seabed and the new development continued until the 1950s with the building of oil and timber jetties and the Ocean Pier extension to Alexandra Basin, after which, the bell was laid up in the corner of the port dockyard. The last job carried out by Joe and his team in the diving bell was to lay the caissons for a new lead-in jetty and it was a particularly arduous job as the area had been prepared by a bucket dredger and there were many ridges. Sometimes the team, working in thigh boots and overalls, had to move as much as ten tons of material on the seabed on a single shift and this frequently involved shovelling much of this onto the side platforms to be disposed of later. Joe developed a unique method of levelling by driving pegs into the seabed and relating them to the depth gauge in the bell. The work on each caisson involved moving the bell about six times. Sometimes the hot compressed air reacted with the cold water and created a fog that blotted out all visibility in the bell. One of the few perks of working in the diving bell was to find a few plump flatfish that had been left behind on the bottom when the water receded, for their supper. The access shaft of the bell was lengthened at this time to take account of the greater depth in which it was being used. Bindon Blood Stoney, Biography of a Port Engineer. Ronald Cox. Monograph 1990. 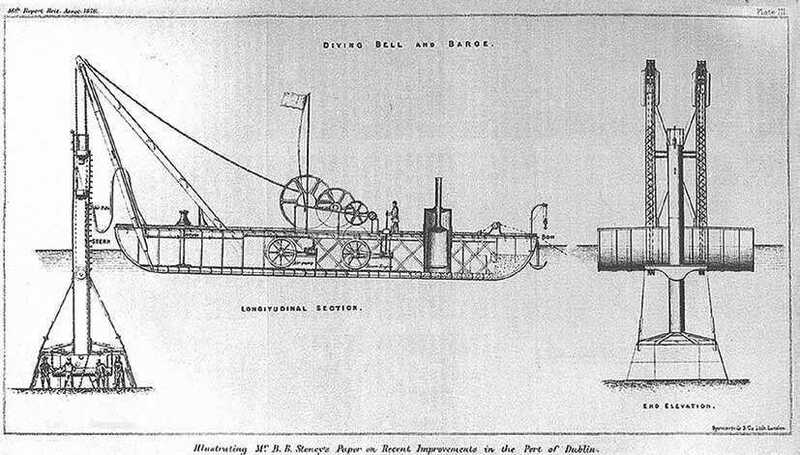 Dublin’s Diving Bell, a History. St. Andrews Resource Centre monograph 2003. Joe Murphy, Ringsend Boatbuilder and Master Shipwright, Autobiography, 1989. History of the Port of Dublin, Harry Gilligan. 1989. 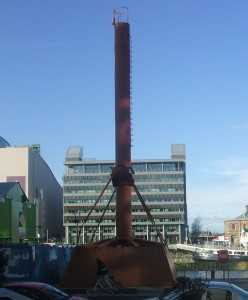 Dublin Diving Bell, Cormac F. Lowth, SUBSEA, no. 81 Autumn 1995. Joe Murphy, Personal Interview. Wreck and Rescue on the East Coast of Ireland, John de Courcy Ireland. 1983. Illustrated London News. Joe Murphy, Desmond Branigan, Tony Brennan, and The Late Robbie Brennan of the Maritime Institute of Ireland. Cormac Lowth is a building contractor who has been a sport diver for many years. He has written many articles of historical and travel interest for several diving and historical magazines and journals. He is a member of the Maritime Institute of Ireland, The Old Dublin Society, and the Irish Maritime Archaeological Society. He is well known as a lecturer to many historical and diving societies.